The cuisine of Picardy is not the best-known or trendiest style of French cooking but I don’t care. I like it anyway. The dishes tend to be straightforward, made with familiar ingredients and are full of strong, comforting flavours. Admittedly, some of them can also be pretty rich and a stranger to the notion of portion control. Caghuse is one of the more restrained Picardy recipes. It’s often served cold in Picardy but, while there’s nothing wrong with that, I think it’s nicest served hot on a cold day. There are different ways of spelling the name of this dish and there are many different ways to make it too. Essentially it’s a one pot dish of slow-cooked pork with onions and vinegar but there are plenty of possible variations along the way. I use chicken stock and cider but beef stock and beer can be used instead. You could also add some herbs to the dish, if you fancy – sage and thyme work well. Strictly speaking, the pork should be cut from the leg and should be on the bone, but I use boneless shoulder steaks, which are usually decently priced and work well for me. A few of the fine new potatoes grown in Picardy are probably the most common accompaniment, but some restaurants serve the dish with rice or chips. I wouldn't say no to some green beans alongside too, possibly tossed with a fair bit of garlic. Ideally choose a casserole dish that can be used both on the hob and in the oven and is large enough to contain all the pork in a single layer. Cut the onions into thick slices. (I cut off the top and base of the onions, peel them, slice them into segments from top to bottom and then separate the layers). Preheat the oven to 160°C. Place the casserole on the hob and melt the butter over a medium heat. Fry the pork until it’s lightly coloured on both sides. Remove the pork, turn down the heat and deglaze with the cider and cider vinegar. (Don’t allow the cider and vinegar mix to reduce too much). Spread half of the sliced onions over the base of the casserole. Season well with salt and pepper. (You could add a little sage or thyme at this stage if you fancied it). Return the pork and any juices to the casserole on top of the layer of onions. Again, season well with salt and pepper. Scatter over the rest of the onions and sprinkle over the sugar, if you’re using it. Pour in the chicken stock. Cover the casserole and place in the oven for 2 hours (Check after an hour that it’s not drying out too much). After 2 hours the pork should be very tender and the onions should be soft. Remove the casserole lid and continue cooking for further 20 minutes. At the end of this time the liquid in the casserole should have reduced and the onions should have taken on some colour. Make sure that the dish doesn’t dry out completely, though. It’s now ready to serve, assuming that you want to eat it hot. At this stage, some restaurants stir in a tablespoonful or two of crème fraîche to enrich and extend the sauce. It may not be traditional, but it’s a very pleasing addition if you want a little luxury and you don’t mind the extra calories. The theme for the Autumn Four Seasons Food Challenge is 'Soups, Stews and One Pot Wonders'. I'm not sure that I'm ever capable of wonders but I did only use one pot, so hopefully this will do as an entry. It’s probably just another one of my odd ideas, but gingerbread always seems to be the perfect thing to take on a country walk, especially in the autumn or winter. For some reason, though, it’s something that I hardly ever bake. 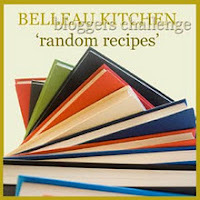 On this occasion I had no choice since it’s the recipe that came up as my random selection for this month’s Random Recipe challenge hosted by Dom over at Belleau Kitchen. The book that I randomly selected this month is ‘Leith’s Book of Baking’ by Prue Leith and Caroline Waldegrave published back in the 1990s. I don’t think this book is in print any longer, but it consists of recipes taken from the Leith’s Cookery Bible, which is still available. I've rarely used this book, but I now realise that there’s no good reason for that. This turned out to be a lovely, moist gingerbread with the blackness coming from a healthy dose of treacle. Even better, you can find the recipe on the Leith's site here. The on line recipe has a few minor changes to the version in the book, the most significant being a reduction in the baking time and that’s a change that I’d definitely agree with. I halved the quantity given in the recipe and used a loaf tin, which reduced the baking time a little more, as you might expect. If I make this again (and I'm sure that I will), then I’d probably increase the amount of ginger a little and reduce the amount of cinnamon - but that’s just down to personal preference. Definitely a recipe I’d recommend, especially if you’re planning on strolling through the countryside any time soon.